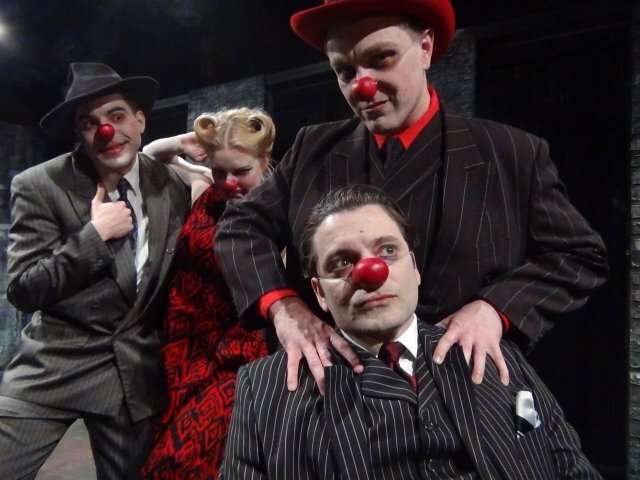 The Resistible Rise of Arturo Ui at Trap Door Theatre. Round Heads and Pointed Heads at Red Tape Theatre. ensemble. Photograph by Austin Oie. From left, Blackadder, Truax, Dukich and Brun. Photo courtesy MLA. 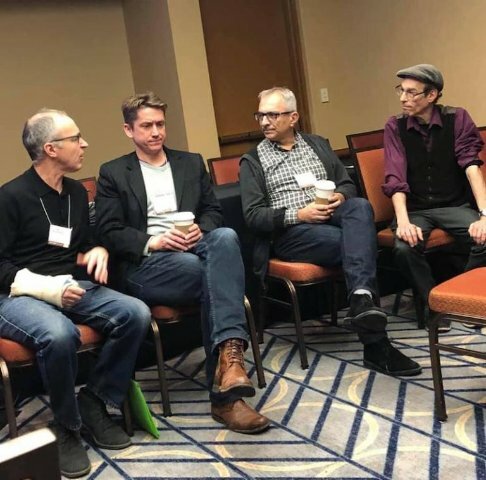 “How did you discover Brecht?” That was the first question asked of the four theater directors by the moderator at this engrossing session on “Brecht in Chicago/Brecht and Chicago.” It was part of the 2019 meeting of the Modern Language Association, attended mostly by academics, at a Chicago hotel last weekend. I attended this session, not as an MLA member, but because it was about Brecht and I’m a fan—and it was open to the public. (H/T to Stefan Brun for posting about it on Facebook.) I discovered Brecht many decades ago, when I was just becoming a theater lover. I’m not sure I had ever heard of Bertolt Brecht when I saw what has become one of my favorite plays—The Resistible Rise of Arturo Ui—at the renowned Tyrone Guthrie Theater in Minneapolis. It was 1968 (I had to look that up), one of the first years of the Guthrie’s existence. I was enthralled by Brecht’s depiction of Chicago’s gangster culture, the corruption of the cauliflower business, headquartered in Cicero, and the cartoonish nature of the Ui/Hitler thug. I’ve tried not to miss a Brecht play since then and gained new insights in this discussion. Silberman also asked each director to talk about the challenges of staging Brecht and how their audiences reacted. Brecht was apparently fascinated by the city of Chicago and set several plays here, even though he had never visited the city while he was writing those plays. When he moved to America during the Third Reich in the 1930s, he lived first in New York and then in California, before moving back to Germany in 1947. He did make a road trip across the U.S. that included a stop in Chicago. Brun, who is German born and grandson of German actor Fritz Kortner, described Brecht’s view of Chicago symbolizing the conflict between traditionalism (which he equated with old Europe) and forward thinking. Brecht was fascinated by what he saw as Chicago’s gangster culture, commodities trading, vigorous sports like boxing, and ostentatious wealth. He saw the city representing a fundamental new relationship among people. Brecht’s view of theater was opposed to the traditional idea of theater as entertainment or enabling audience members to suspend disbelief and believe the actors on stage were portraying real people. Brun also described how he approaches a Brecht script—as a way of devising theater, treating each as a new play. Brun directed St. Joan of the Stockyardsand more recently, The Last Days of the Commune at Prop Thtr. Truax, who grew up in Rockford, told about the first play he directed when he moved to Chicago–Brecht’s In the Jungle of Cities, one of the so-called Chicago plays. Truax said he equates Brecht’s plays with the music of Tom Waits with their “raw, clunky nature” and the “plink plonk” of the dialogue. He sees Brecht as a game tactician and the audience as being inside the game, not being told a story. Truax directed The Mother at the late Oracle Theatre and Round Heads and Pointed Heads this year at Red Tape. Dukich, who divides his time between Serbia and Chicago, teaches theater at UIC. He said his undergraduate acting students are shocked at their first exposure to Brecht. He usually has them do scene work and finds it easier for his students to begin by “singing” Brecht to become comfortable with the physical language. He also has them study the facts of a scene or play and then improvise action based upon the facts. He directed Brecht’s Baal and A Wedding during the time he was artistic director at Tuta until 2013. The directors all described, in one way or another, Brecht’s concept of epic theater. His approach includes a lot of fourth-wall breaking, dividing the play into individual separate works, and interrupting the action with songs, commentary and explanatory placards. 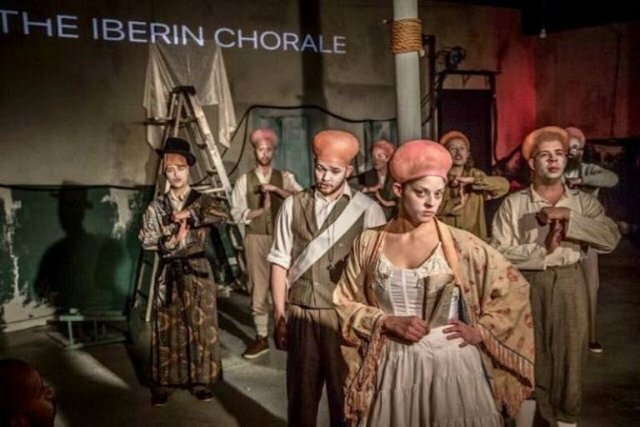 Epic theater, in Brecht’s thinking, meant estranging the audience from the action on stage, making them realize this was a play and not reality, and encouraging them to reflect on the nature of the crime and injustice represented on stage. Knox professor Blackadder directs several student productions each year. He described the protests that arose last year when he called for auditions for Brecht’s The Good Person of Szechwan.The student protests, which spread across campus and then received national media attention, involved a list of grievances, which included the fact that the Szechwan Brecht describes isn’t anything like the real Szechwan. (Blackadder noted that Brecht did not intend to reflect the real China any more than he meant to describe the real Chicago.) The grievances also cited “whitewashing” and tokenization in casting, and accused Blackadder and the theater department of a history of racism, although Blackadder said the department had been casting plays with diverse actors. Blackadder said he would have liked to discuss the issues with the students but it became clear that canceling the production was the only response. Instead they produced some of Brecht’s Lehrstücke or Learning Plays, a set of experimental scripts. The MLA, which has 24,000 members in 100 countries, is dedicated to the teaching of languages and literature. At its annual conventions, members share their scholarly work and teaching experiences in literature, language, writing studies, screen arts, digital humanities, pedagogy and library studies.